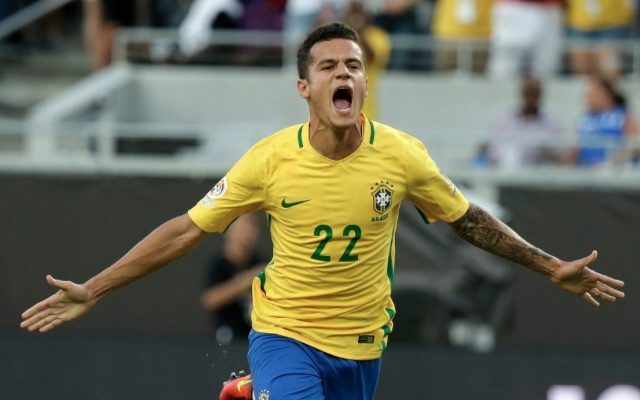 Liverpool star Philippe Coutinho lit up Copa America last night with a superb hat-trick in Brazil’s 7-1 thrashing of Haiti. Coutinho’s first professional treble may have been against unheralded opposition, but it was certainly of the highest quality. Below you can watch all three of his goals. One was a simple tap-in, but the other two are stunning long-range strikes after mazy dribbles. The 23-year-old had previously only scored once in 15 Brazil caps, and head coach Dunga was pleased to see him finally make an impact. “He’s been acquiring more trust and belief in himself and taking more risks. That’s what we wanted,” he is quoted by BBC Sport as saying. Coutinho scored Brazil’s opening two goals and completed his hat-trick in stoppage time, after Renato Augusto – twice – Gabriel and Lucas Lima had also found the net.